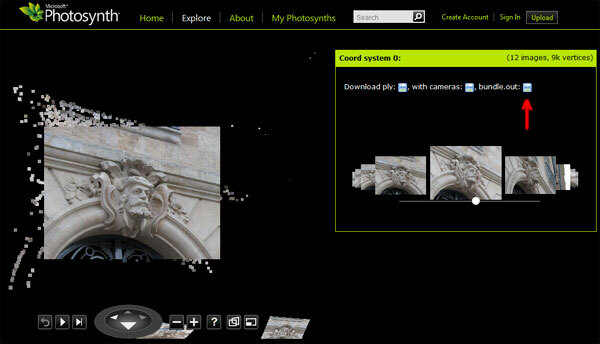 I’ve updated my Google Chrome extension to export a valid bundle.out from a PhotoSynth. The bundle.out generated need to be used with HD version of the images (not the thumbnails). Moreover I’ve removed tracks of length 2 from the bundle.out as I guess that PhotoSynth is keeping them only to get a “denser” point cloud (aesthetic purpose only)? One more thing: you can not use the bundle.out file to run a bundle adjustment as the 2d measurements are unknown (I have computed them by projecting the tracks in corresponding cameras). I’m sure that some of you have an idea of what to do with a bundle.out file from a PhotoSynth . BTW, this export wouldn’t have been possible without Peter Sibley help, thanks Peter! He has help me by giving me the missing information needed to do the bundle.out PhotoSynth export.